For the Romanian commune, see Bârsana. 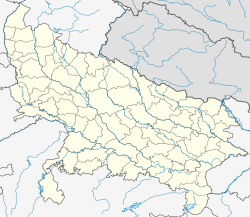 Barsana is a historical town and a nagar panchayat in the Mathura district of the state of Uttar Pradesh, India. Barsana is the Birth Place of Mata Radha, It is the region of Braj Bhoomi. It is located at 27°39′N 77°23′E﻿ / ﻿27.65°N 77.38°E﻿ / 27.65; 77.38. As of 2001[update] India census, Barsana had a population of 9215. Males constitute 53% of the population and females 47%. Barsana has an average literacy rate of 53%, lower than the national average of 59.5%; with 66% of the males and 34% of females literate. 19% of the population is under 6 years of age. ^ "Barsana, India". Falling Rain Genomics. Retrieved 9 December 2018.